• Basic Training Oct 26, 1963 - Ft. Dix, New Jersey. • AIT training 1st Armored Division - Ft. Hood, Texas. • December 1965, HQ & Svc Try with 4/18 Artillery NATO training. John took over as Ammo Driver as Ruben Martinez was being Discharged. John Service the 8" Howitzer daily with 200 pound rounds. After leaving Japan, John was sent home to St. Petersburg, Florida for a recovery leave. 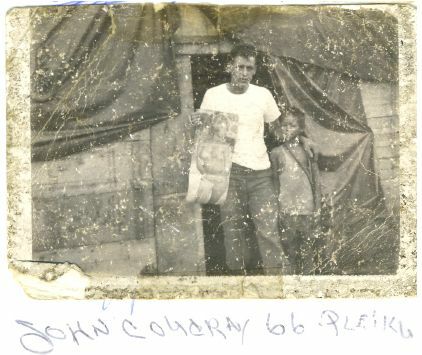 After recovery, John was sent to Ft. Jackson, South Carolina - there he stayed until his ETS on Jan 4, 1968. August 1966, as John was ordered to take powder bags by Cpl Kemple and burn the mess hall trash, which flashed backed on him. John was MEDEVAC'd out of Pleiku unconscious to 66 holding area. John was transferred to the106 Hospital in Yokihama, Japan and was a patient there for 1 year. Even in pain, with very bad burns, John always managed a Smile - the man with John was his medic. John was never returned to the 3/18 Artillery after injured. Even though John got hurt in Vietnam, the 4/18 was activated approximately 6 weeks for Nuclear testing with Russia. Three officers and one 1st Sergeant took a Direct hit of Nuclear after John Coudray left Germany. These men were hospitalized for over a year - the Sergeant now lives in Catalina, Arizona. Colonel Sims, the historian, had been looking for several years for the 5th man. John's Military Picture was turned in at Regimental HQ April 3, 07. John and Kathleen make there home in St, Petersburg Florida. Plug-in for MP3 required for features on this page.